Official Stockist of Alpha-H. Buy now, pay later with Afterpay. Alpha-H strikes a balance between nature and science, using the highest-quality ingredients to deliver fast and noticeable results. Whether it is the brand’s signature Glycolic Acid or its expertly researched Juveleven Peptide, Alpha-H blends cocktails of potent botanicals and vitamins to craft targeted skincare that transforms complexions. Alpha-H is constantly creating new products that target specific skincare concerns, whether that is fighting acne-prone skin with its Clear Skin range or turning back the clock with its Liquid Laser Collection.for mature and ageing skin The brand’s collections are always expanding to accommodate for new formulations and ingredients. Always at the forefront of the industry, Alpha-H offers the latest in skincare, such as its revolutionary Vitamin Profiling Collection, which allows for flexibility in a daily routine. The company’s highly coveted products are available in generous Starter Kits, so you can find the combination of formulas that works best for your own complexion. Researchers at Alpha-H listen closely to customer concerns and requirements to ensure their skincare routines are as simple and effective as possible. All Alpha-H products have been designed to be multipurpose, so your skincare collection is reduced to a simple routine consisting of two or three highly effective steps. 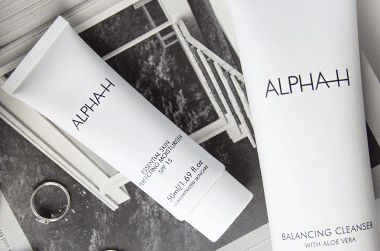 A moisturiser by Alpha-H is never just a moisturiser. Combining potent active ingredients, scientific research, natural botanicals, and easy-to-use products, Alpha-H continues to revolutionise the skincare industry and provide the highest-quality skincare products to customers all around the world. Showing 7 products of 47. Is Alpha-H Skincare Worth the Hype? What are AHAs and Why Are They in Alpha-H Products? I find this product quite a great value for money ive still got over half a bottle left and has already lasted me a few months. Whilst i dont find it removes my makeup well it is a great light cleanser that makes my skin feel nice and soft! I have combination dry skin however I do occasionally breakout from the odd heavy product. This is certainly not one of them, I found this moisturizer perfectly combated by combination skin, it hydrated my dry flaky areas, while not causing breakouts. It also gives you a nice glow the next day like you've just had a mini facial. I have only been using this product for a few weeks and not every day as I like to alternate my active products, but this is a nice easy cream to use with or without a serum underneath. It does have a bit of a tingle on first application but it subsides quickly and doesn't last. Would purchase again.